Thalwil, Switzerland – April 17, 2018 – u-blox (SIX:UBXN), a global provider of leading positioning and wireless communication technologies, has announced the new NINA-B2 dual-mode Bluetooth® 4.2 stand-alone module, ( https://www.u-blox.com/en/ublox-file-auth-redirection?destination=node/22898) enabling industrial IoT applications thanks to its built-in secure boot and wide temperature ranges. Pre-flashed with u-blox connectivity software which supports many common use cases such as Beacon, GATT client, GATT server, and serial port, NINA-B2 is configured easily using AT commands over UART, without requiring deep knowledge of the Bluetooth protocol. Already tested and certified globally, it also reduces development costs and speeds time to market. NINA-B2’s built-in secure boot guarantees that the software is authenticated by u-blox and has therefore not been tampered with. This provides a secure operating environment for the Bluetooth module. NINA-B2 is very compact, at 10 x 10.6 x 2.2mm (without antenna) and 10 x 14 x 3.8mm (with antenna). Most of the Bluetooth modules at this scale are single-mode Bluetooth low energy or Bluetooth BR/EDR devices. NINA-B2’s size makes it an easy fit in any IoT device. 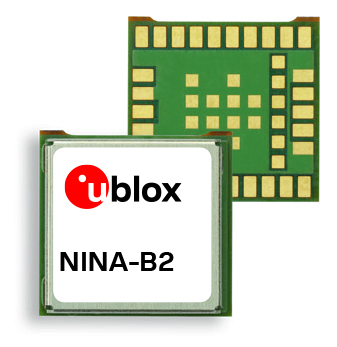 It is also pin-compatible with the u-blox NINA family, ( https://www.u-blox.com/en/short-range-modules ) allowing it to be easily swapped in or out with other NINA modules, with their different radio technologies such as Bluetooth low energy and Wi-Fi. Apart from industrial automation such as machine control devices, industrial terminals and products for remote control, possible applications also include wireless-connected and configurable equipment, point of sale, telematics, and health devices. NINA-B2 should go into production in summer 2018.